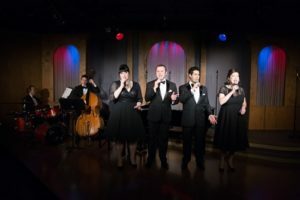 For a great trip through memory lane of Broadway and some 1950’s jazz, nothing fills the bill like the current show at Quality Hill Playhouse with a fabulous quartet of vocalists, backed by a stunning instrumental combo as they perform music from the Fabulous Fifties. Can’t be sure how J. Kent Barnhart pared down the plethora of choices available to him from the era of big Broadway shows, big band singers beginning solo careers, and jazz selections that reverberated some of the Broadway melodies while still developing new rhythms and sounds. 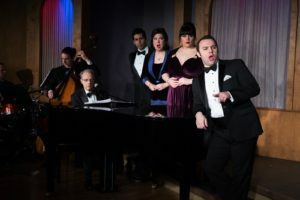 The task must be arduous, but the result, sublime as “Broadway and All That Jazz: Songbook of the 50s”runs through April 7 at Quality Hill Playhouse. 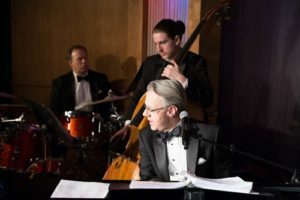 Barnhart, artistic director, keyboard artist, and producer masterfully selected a nice sampling of music for his audience, laced in his educational piece to introduce his audience to some lesser known selections, and perfected the evening with his choice of performing artists. For the back up accompaniment, Ken Remmert on percussion always pleases the audience, and a younger performer, Ben Tervort, masterfully plucks the base. 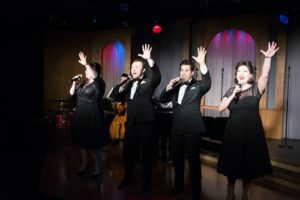 As for the vocals, the four performers, Christina Burton, Val Fagan, Robert Erik Sobbe, and Joseph Carr create the vocal mastery for the show. How can a show fail when it opens with a Julie Styne/Stephen Sondheim blockbuster number from “Gypsy”? The lively and uplifting “Everything’s Coming Up Roses” by the quartet introduces the audience to the music to follow. After that and the introductions of the band and vocalists, the cavalcade of solos, duets, and quartets begins. Of course, Ethel Merman introduced the world to Gypsy Rose Lee’s overbearing mother, Rose, but in another lesser known and performed Merman show, “Call Me Madam,” Merman sang “The Hostess with the Mostest.” For that, Barnhard needed someone who could belt a flirty song in the true Merman fashion, and none of his bevy of performers can do that like Christina Burton. She sets the tone for the songs to follow. Burton’s delivery can be as powerful and strong as Merman or as soft and touching as any love ballad. Her range and ability to adapt to any genre makes her perfect for Quality Hill’s music. No one can forget the fast-talking con man, Professor Harold Hill from Meredith Wilson’s “The Music Man,” as performed on stage and screen by Robert Preston. But, tune your ears and pay attention as Robert Erik Sobbe steps out and delivers the tongue-twisting patter with precision, accuracy, timing, and flash. “Ya Got Trouble” sounds fresh and new with Sobbe’s delivery and expressions. Sobbe, in his fourth or fifth production at Quality Hill knows how to sell a song, grab the audience, and connect quickly to them. His performance on this and his subsequent songs is great. Val Fagan, new to Quality Hill Playhouse, made a long overdue debut at the Q. And, to be sure her memory and song delivery remain. 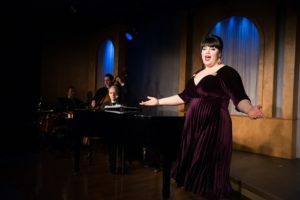 She opens with “Rose’s Turn,” the end and signature song of Mama Rose from “Gypsy.” Fagan’s connection with the audience and the plaintive belting style of Ethel Merman drew some of the loudest applause for the show. 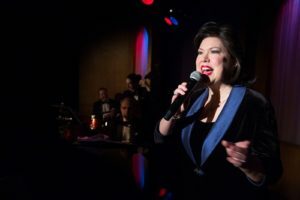 Fagan and Barnhard were destined to work together as this cabaret style show allows her to display her vocal talents on so many different levels from solos, to tight harmonies, to duets and from love songs to enthusiastic up-beat numbers. Expect to see more of Fagan in subsequent shows. As the fourth soloist, Joseph Carr, like Sobbe fits the QHP format like it was tailor made for his vocal artistry. Carr can sing comic, up-tempo, love songs, and about anything handed to him. His first solo of the night, “Something’s Coming” from Leonard Bernstein and Stephen Sondheim’s “West Side Story” gives an inspirational note of anticipation. 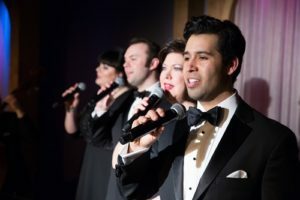 Carr can do that with ease, then croon a ballad, and later team with Sobbe on a “Guys and Dolls” duet, “Luck Be a Lady.” Carr, also in his fourth or fifth show with QHP seems to have found his niche. He can blend into any cast and perform any type of song. With this focus on Broadway and Jazz, this season, Barnhart gives more opportunity and solo interludes to his combo-mates, Remmert and Tervort. In several selections each has an 8-bar solo, allowing their masterful skills to be recognized and applauded by the audience. 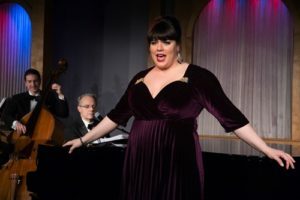 “Perhaps no decade in American history had more personalities to its music than the 1950s, and this dynamite and dynamic cabaret revue will pay tribute to this variety of sound,” according to a QHP spokesman. Act II features Jazz, and specifically the developing Jazz associated with both instrumental and vocal performances. 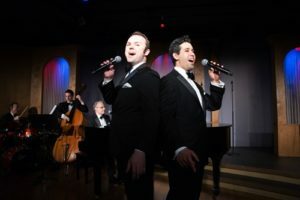 Act II features vocal jazz ballads (“When I Fall In Love,” “Guess Who I Saw Today”); vocalese (“Everybody’s Boppin’,” “Four Brothers”); easy, cool jazz (“Misty,” “Teach Me Tonight,” “Satin Doll”); and a seldom-heard four-part vocal arrangement of the Dave Brubeck classic “Take Five,” according to QHP. Quality Hill Playhouse focused on a great theme this season to focus on a different decade for each show. Next up, the Songbook of the 60s promises more current tunes and another selection quandary for Barnhart to find the perfect pieces for his audience’s pleasure. Do not miss the Songbook of the 50s and All that Jazz currently running at the Q. Dates, show times, and ticket pricing can be found at the Quality Hill Playhouse website.